Are the pharmacogenes in the 23andMe product clinically valid and useful? Clinical validity refers to the strength of association between the gene and drug response. This includes both the evidence supporting statistical significance and reproducibility of results, as well as the predictive value of the test. Clinical utility refers to whether the test results impact prescribing action (drug avoidance or dosing change). The availability of guidelines from the Clinical Pharmacogenetics Implementation Consortium (CPIC) is probably the best indication that a pharmacogenetic test has both clinical validity and clinical utility. All eight 23andMe pharmacogenes are supported by CPIC guidelines, characterized by the strongest evidence of clinical validity and utility. In contrast, most commercially available comprehensive PGx tests include a mix of CPIC guideline genes and those not backed by CPIC guidelines. How many commonly used drugs are covered? Among the 16 genes with published CPIC guidelines, eight of them are for drugs that are among the top 200 most widely prescribed (first eight in the table below). These eight genes cover 17 commonly prescribed drugs. In this category of genes for commonly prescribed drugs, 23andMe tests for four genes covering 14/17 drugs. A comparison between 23andMe and six commercially available comprehensive PGx tests is shown in Table 1. How well does the 23andMe PGx product detect relevant variants? This question is getting at the analytical validity of the 23andMe assay. 23andMe uses a genotyping array to detect variants in pharmacogenes. Sensitivity can be thought of in a couple of different ways: First, whether their assay design is sufficient to detect all relevant variants in the gene; and Second, for variants that the assay is designed to detect, what are the technical specifications, i.e. the sensitivity and specificity of the assay. To answer the first part, we can take a look at the variants their assay is designed to detect and compare them to a list of known common variants in each gene. 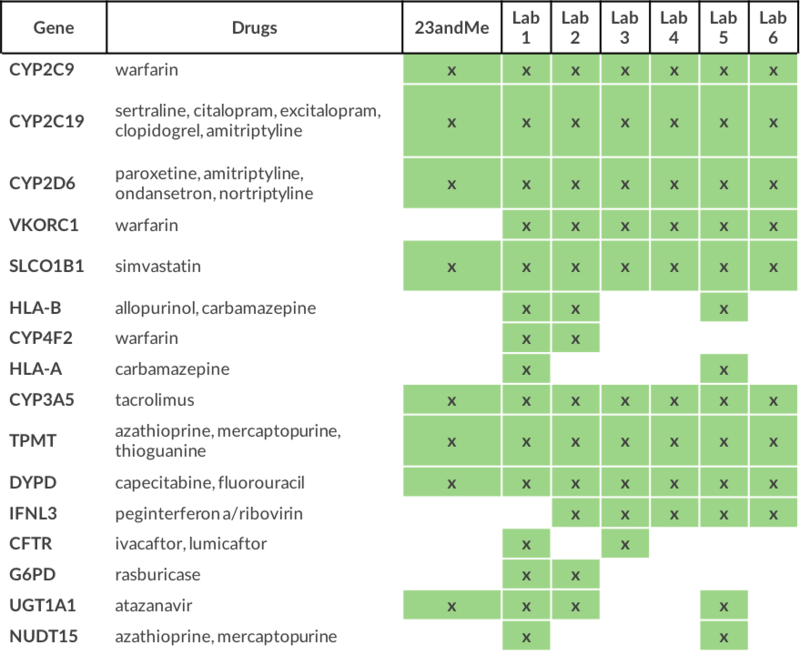 As shown in the table, 23andMe covers many, but not all, of the common variants impacting activity of these pharmacogenes. In contrast to commercially available PGx tests, 23andMe is missing some important alleles, most notably in the cytochrome P450 genes (CYP2D6, CYP3A5, CYP2C9 and CYP2C19). For CYP2C19, the missing allele is common in African populations and not consistently tested for by commercial PGx labs. For CYP2C9, the 23andMe product misses two variants common in African populations, and these are both uniformly covered by other labs. For CYP2D6, 23andMe misses two alleles with non-uniform coverage by other labs. Most notable, the 23andMe product does not cover important, common gene duplication events that occur for CYP2D6 resulting in increased enzyme activity and resulting in a rapid/ultrarapid metabolizer phenotype. These duplications are uniformly captured by commercially available PGx tests. The net effect of skipping these alleles will be a higher rate of false negative results. A person with one of these alleles may receive a result that implies normal drug metabolism when in fact they may be poor, intermediate or rapid/ultrarapid metabolizers. The second important aspect of analytical validity is whether the assay has good sensitivity and specificity. Good sensitivity refers to whether the assay accurately detects variants that are present (i.e. has a low false negative rate). Good specificity refers to whether a variant that is detected is real (i.e. has a low false positive rate). Sensitivity and specificity are related to both the assay method used as well as the laboratory’s procedures. The most common methods for detecting simple genetic variants include sequencing and genotyping. Because commercially available pharmacogenetic tests uniformly report a set of known variants for a gene (as opposed to newly identified variants), genotyping is a suitable assay method. Genotyping assays, when designed correctly, have good sensitivity and specificity, and in some cases, are superior to sequencing (e.g. when the gene is subject to duplication events or in proximity to pseudogenes). The trend by some commercial PGx companies toward using sequencing methods for pharmacogenetic variant detection is often meant to leverage their use of the technology for other products. Sequencing is not inherently better than genotyping for known PGx variants. 23andMe uses genotyping arrays to detect simple PGx variants. Their own data provided to the FDA to obtain clearance for their product states a high sensitivity and specificity for the variants analyzed. For larger variants, specifically deletions and duplications (del/dups), which are common and important for genes like CYP2D6, separate detection methods are usually required. While most commercial PGx labs routinely include these detection methods for del/dups, 23andMe does not, and instead simply does not report this type of variant. So, is the 23andMe pharmacogenetic test any good? The bottom line is this: If your patient has results from a 23andMe pharmacogenetic test that suggest they have a variant that would impact prescribing behavior, they probably do have that variant. Even though the 23andMe tests were cleared by the FDA based on evidence of good analytical validity (sensitivity and specificity of the genotyping assay), if you’re tempted to use this information to make important treatment decisions, consider re-testing through one of the commercial clinical labs that specializes in PGx. They will provide validated test results as well as clinical guidance for how to use the information. But, if the 23andMe result say that there are no variants impacting prescribing behavior, that might not be true. Given the real risk of false negative test results, anyone interested in pharmacogenetic testing should seek a clinical grade test from an established PGx testing lab. If you are interested in learning more about pharmacogenomics, make sure to check out our Pharmacogenomics in Practice online short course. Also, don’t forget to subscribe to our mailing list to receive updates on new content and courses as soon as it’s available.